Romance and pops of modern seaside decor, and it all works perfectly mixed together! Love the idea of this luxurious rug covering almost the entire space, combined with a delicate shower curtain trimmed in matching turquoise. A pretty chair and dressing table to sit and dream, with bright stripes of lime green, blues and aqua. Topped off with a velvet pillow for a touch of elegance! 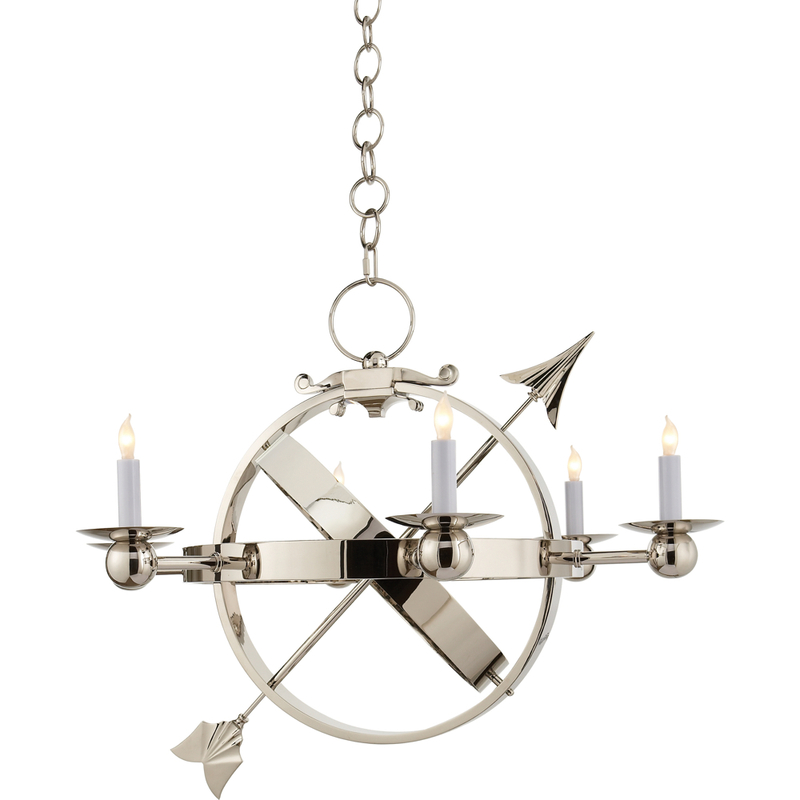 Not to mention the awesome polished nickel sphere chandelier! If this was my master bath, Tom would have a very difficult time prying me out of that tub. Bubbles and candles here I come! A tad bit of advice about your bath hardware - make sure that you choose one finish for everything. For example, if you like polished nickel, then choose polished nickel for the pulls, knobs and faucets. If you mix your finishes, for example chrome and nickel, over time there will be a very distinct difference in how everything looks together. Nickel is warm, and may patina, polished chrome is colder. Trust me on this! Sources for chandelier: A quick Google search for "Eric Cohler Armillary Sphere Chandelier" will bring up many retailers. (I don't have any personal favorites to recommend!) I like how the designer of this bathroom added the white silk-like shades to soften the look and give the chandelier a nautical-romance vibe. Have a wonderful relaxing weekend!